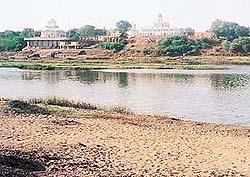 EVEN today, the 1440-km-long mighty Godavari, the lifeline of Central India, flows serene and quiet. But just as it prepares to cross over into Andhra Pradesh from Maharashtra, its waters suddenly turn holy! The place where this happens is Nanded, better known as Hazoor Sahib. Here in 1708, humanity was a mute witness to the touching finale of its saviour’s departure from this world! The saviour who had shown it how to stand up to the ever-stalking storm-troopers, persecutors and tyrants, the saviour who had sacrificed everything, including his family, in serving it, the saviour who, having accomplished his unique mission in this world, left behind an eternal beacon of love and universal brotherhood for everyone to see and take guidance from! This saviour who walked the earth for barely 42 years was none other than Guru Gobind Singh. Bhai Nand Lal, a great poet and a devout disciple of the Guru, describes him as God’s messenger and a friend of the helpless people (Kader-e-Harkaar and be-kassan ra yaar) in his immortal verses. In his autobiography, Guru Gobind Singh states how the Almighty had ordained him with the task of restoring dharma (righteousness) and decimating evil. Besides deeply immersing himself in meditation, Guru Gobind Singh traversed the countryside, helping the badly-mauled and fear-stricken society. He fought 14 battles with the Imperial Army and its stooges and helped Bahadur Shah Zafar ascend the throne of Delhi. Now coming to HazoorSahib, first of all, a question that comes to the mind is that why did Guru Gobind Singh go all the way to the South to unite with the Lord! It is believe that Guru Gobind Singh had particularly chosen this spot because in sat yuga, he had done tapasyahere! (Just as in another birth, he had done tapasya at Hemkunt Sahib in the Himalayas). It is held that he paid for the land in gold coins to Bahadur Shah in the presence of some maulvis, after the spot was dug up and some artifacts — as indicated by the Guru — were recovered! Till this day the descendants of these maulvis are gifted with rations on their festivals by the shrine authorities. No wonder, the pilgrims visiting the shrine not only comprise Hindus and Sikhs, but also Muslims. Tribesmen like Lambardis and Sikligars, who come here in hordes can also be seen listening to kirtan with great devotion. Banjaras had earned a distinct place in Guru’s heart with their devotion and service. 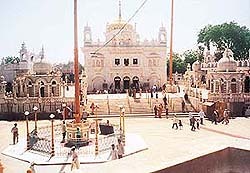 This shrine differs from other historical places of Sikh worship, including Harmandar Sahib of Amritsar. All ancient customs which were practised at the time of the Guru are still followed here. For example, sandal-wood tilak is still applied on the foreheads of priests and local devotees. This practice was followed by the Guru himself. The holy book on which he used to apply tilak every morning is unfortunately missing. The most important aspect of this holy shrine is that there are two sanctum sanctorums here. While all the functions are carried out by the priests in the outer room, the inner room is a vault which houses priceless objects, weapons and other personal belongings of the Guru. No one except Baba Kulwant Singh, the head priest— the 31st in line of succession — can enter this holy vault! He is a brahamachari. His day starts exactly two hours after midnight! That’s the hour Guru Gobind Singh used to wake up and take his bath before sitting down for his meditation! The devotees, without crossing the threshold of this vault can have a view of the interior and seek blessings. It is believed that one’s prayers are granted by the Guru provided one goes there with a pure heart! And, if you are seeking moksha, you must reach Hazoor Sahib before the age of sixty. The nearest airport to Hazoor Sahib is Aurangabad. The most suitable direct train from the North is the (Amritsar-Nanded) Sachkhand Express.